In the last post of Spare Change, we discussed thrift verses theft—the fine line between being thrifty and essentially stealing products or services to save a dime. But that’s not the only line you have to steer clear of when trying to live on a budget. There’s also a fine line between thrift and tackiness. It may be legal and even moral, but if it is going to leave people shaking their heads and wondering about your sanity, it’s probably tacky. 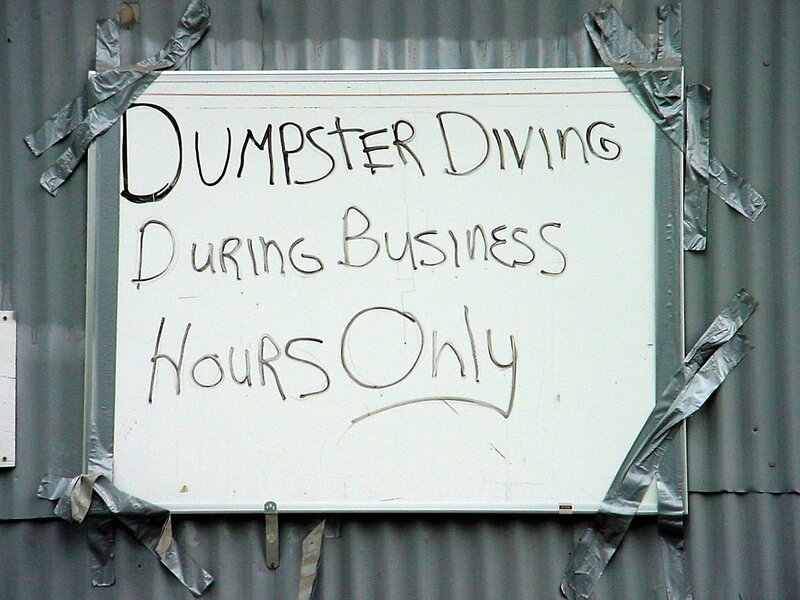 One of the most obvious issues that straddles this line between tacky and thrifty is “dumpster diving” —the practice of fishing through trash, looking for treasure. On one hand this can be fundamentally disgusting in that you may be sorting through spoiled foods, poopy diapers and who knows what else, looking for loot. This can be quite risky when it comes to health and personal safety (razor blades, knives, broken jars!). On the other hand, if a neighbor leaves something reasonably nice by the dumpster, an old end table or bean bag, why shouldn’t you take it? If you can use it or “up-cycle” it into something else, why should it end up in a landfill? Clearly, by setting it to the side of the dumpster, the neighbor intended to potentially have someone else get some use out of it (this happens almost every week in my apartment complex.) Some people believe so strongly in using other people’s garbage that they’ve made it a religion of sorts. It’s called Freeganism, and its practitioners, Freegans, are often anti-consumerism and, according to Wikipedia, “employ a range of alternative living strategies based on limited participation in the conventional economy and minimal consumption of resources.” Even these best-intentioned divers should take care to retrieve discarded items without compromising safety or health. As we rapidly approach the holiday season, the issue of re-gifting or giving second-hand gifts will be a hot topic. On which side of the thrifty/tacky line this falls depends on motives and intentions. If you are re-gifting or second-hand shopping merely because you are too cheap to buy a “real” gift, you may be in tacky territory. However, if you were given an item that you absolutely can’t use or isn’t your style and know that someone else would love it, then it’s okay to bless them with that item. (This should go without saying, but just make sure the original giver and new recipient won’t cross paths to avoid an awkward situation; or if you think they might, meet it head-on and tell them both about the re-gifting.) Or if you know that someone loves second-hand or vintage items, then the thrift store would be the perfect place to shop for that person. Then, in the spirit of Freeganism, there are those who for whatever reason—to lighten Christmas’s carbon footprint, reconcile the holiday with their non-consumerist values, etc.—have a standard for giving only hand-made or second-hand as gifts, and that’s great too. The point of gift-giving is to show a person that you love them and have put some thought into giving them an item that they would really like to receive. If you are giving out of obligation and trying to get off as cheaply as possible, you should examine your motives and consider alternatives to traditional gift-giving. Another way people can find themselves wandering into tacky territory is by recycling everything, and I mean, everything. Being green is good for the wallet and the environment, but to avoid becoming a recycling nut, you need to know when to recycle and when to just let an item go. I occasionally wash and reuse plastic cutlery, use paper and wrapping paper cardboard rolls to keep my boots standing straight and use plastic grocery sacks for trash bags. However, there is a point when being green can become disgusting, or even harmful to your health. For instance, Styrofoam containers can get more dangerous with continued use. Avoid taking on Styrofoam in the first place and invest in a ceramic mug or dish. Or possibly, you save money by refusing to call it refuse—you just won’t throw that old toothbrush or pillow away, because, well, they still work! Yes, but did you know that up to 10% of your pillow’s weight can be composed of dead skin cells and dust mites? Make a doggy bed out of it or something, but if you’ve had that pillow for a few years now, it’s time to buy new! (A sleeping pillow is something you definitely don’t want to buy second-hand, unless it’s for your dog). I am all for reducing the amount of trash I haul to the dumpster, but there becomes a point when trash is just that. Learn to tell legitimate trash from recyclables. There are thousands of ways we can turn being thrifty into being tacky (just watch the TLC show “Extreme Cheapskates” some time if you don’t believe it). The key is to take a moment to self-evaluate and ask yourself if what you are doing is safe, healthy and done with the right motives. Ask yourself, “What would others think if they knew I was doing this to save a few cents?” and if you find yourself embarrassed, then find a new way. There are plenty of ways to be thrifty without running the potential of coming off as an eccentric. Previous Thrift vs. Theft: What Are You Justifying to Save Money?